People in pursuit of this illusive idea of work/life balance are often left disillusioned, disappointed, or depressed. Frankly, it is unrealistic for us to strive for this work/life balance when life delivers so many unexpected situations that can ripple into all areas of our lives. Does it mean a perfect work and life situation with no stress or worry? Does it mean you have more than enough time to do what you want on your schedule? People in pursuit of this illusive idea of work/life balance are often left disillusioned, disappointed, or depressed. Frankly, it is unrealistic for us to strive for this work/life balance when life delivers so many unexpected situations that can ripple into all areas of our lives such as lay-offs, health crisis, and divorce to name a few. Work/life balance should not be a way we measure our success but rather the tool we use to check in with ourselves so that we can make the best choices. What I have learned is that work/life balance begins inside of us, not outside of us. I liken it to the stillness of deep waters underneath stormy waves. Similarly, our stillness and happiness are at the depths of the oceans of our being. Knowing this can help us withstand any storms that try to sink our boat. In other words, when we are happy, we feel centered and in control. We make purposeful and powerful decisions that allow life to work for us every moment. In this basic framework, the work/life balance is not an end goal but rather a tool for us to decipher how to steer and command ourselves, maintaining our course of our living our best life. As a business owner, a part-time nurse, a mother of 3 boys, and daughter of aging parents, I am mindful of the constant tug and pull of work/life balance. There are times where I purposely burn the candle from both ends in order to help my company grow. It's a choice that I make in order to be able to make my dreams come true. It's a choice that I happily make in order to be the change that I want to see in this world -- our world. From time to time, I have people in my life that view me as a hypocrite for teaching about harmony, health and happiness because they feel I'm not living up to my own message. I would get comments such as, "Debbie, I don't know how you do it all?" or "I don't think you are living up to your message" or "Your desk is not Zen at all and you teach about mindfulness." While these hurtful comments have knocked the wind out of my sails, I have found that they have made me stronger inside. I've become even more determined not to let their judgment take me off course from following my inner North Star. What I've come to realize, as I've mentioned in my new book, The Happiness Result, is that work/life balance not only starts from within us but it is constantly occurring. Balance is the life force that is in all living things. Balance is what we living beings naturally do in order to grow and flourish. It's no different from when we are listening and following our calling; working extra hours to make our dreams come true. I believe that resisting our calling by listening to our fears and insecurities is the primary cause of the imbalance within and the cause of the work/life imbalance that we hear about. Balance happens when there is no resistance towards growth and flourishing. Balance happens when we allow ourselves to break free from our limiting beliefs and comfort zones. Balance happens when we are happy and clear about what we want. Lastly, balance happens when we feel in control of our lives. Myth #1: Balance means 50/50 all the time. This is impossible because we spend most of our time at work and less at home. Myth #2: Balance can't happen when we are busy. Balance is always happening even when we are busy. It's up to us to trust to our gut instincts when we start feeling off-balance in anyway. 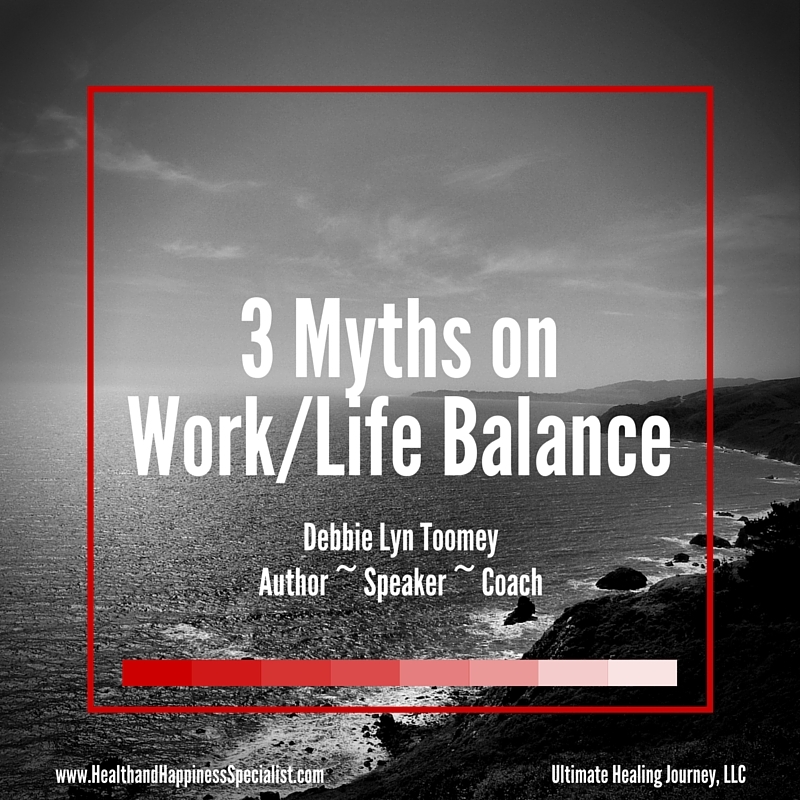 Myth #3: Work/life balance means success. Work/life balance has been overrated leaving way too many people feeling like failures because they can't get it. Work/life balance needs to be reframed not as the measurement of success, but rather a tool that we use and a habit that we must cultivate in order to give voice to the treasures in our heart. When we do this, we can make healthy, happy, and harmonious choices that will lead to a rich and fulfilling life. For further learning about how you can add more of what you want to your life, get your copy of The Happiness Result -- coming out early July 2016. For coaching on how to create your awesome life, visit www.healthandhappinessspecialist.com today.